I've been busy on the tasting circuit this week. Last night I hit up another tasting, this time at Viva Le Vine in Libertyville. I've been going to tastings at Viva Le Vine since I moved to the area 4 years ago. The shop has a strong focus on Northwestern (Washington/Oregon) wines, and a good all around selection as well. Their staff is very personal and good at finding a wine that meets your tastes. 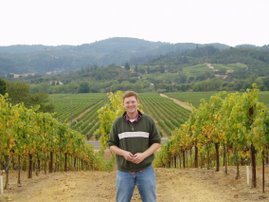 Their wine tasting host, Craig, is very knowledgeable, and had personal experiences with the wineries he would serve wines from. In fact I was starting to get the impression that Craig had visited every winery in the Northwest. I've always liked the shop, and so it came as a surprise when they closed up back in February. I was very disappointed, and missed the monthly tastings. Recently though, the shop reopened, and last night I got an opportunity to stop in and taste some wines. In the past tastings were once a month for 3 days over a weekend. The tasting was always themed around something: Spanish Wines, Holiday Wines, etc. This tasting was different though. Viva Le Vine has made every Wednesday a tasting night. In addition they are keeping the monthly tastings, but it is unclear if there will be themes to any of them. The tasting consisted of 7 wines with no clear theme tying them together. Wines came from Alsace, South Africa, Roselle (yes the Chicago Suburb), Australia, and Oregon. All of the wines we tasted fell into what I consider the "value" range. $10-$20. Most of them were good. There was a Cherry Wine thrown in there that didn't seem worth opening, and an Australian sweet rose that failed to impress. In the end there were a couple of great value reds including a "Sincerely" Shiraz from South Africa. One other thing to note about the tasting was that it wasn't put on by Craig, but by someone who I gathered was his daughter. She was very friendly, and happy to tell us about the wines, but the knowledge didn't seem to flow quite as readily when we asked about some of the bottles. The store was pretty much the same, though it had been reorganized and expanded a little bit. I still feel like the store is set up more for an employee to find you something, rather than for browsing, but the employees seem good at this, so I don't mind too much. There is an expanded section in the back and the new "Reserve Room" is in the space that used to be the tasting room. In the very back there is a table set up for tasting. Its a little disappointing that they lost that nice tasting room ,but sometimes you need more space for inventory if you're gonna stay afloat. For me, the jury is still out on the shop. It doesn't feel quite as quaint as it used to, and I'm not sure about the tasting format. I'll have to see how a weekend tasting goes before I make any judgements. If you're looking for something to do on a Wednesday Night in Libertyville, head in, you can't beat a free tasting. ENO in Chicago is offering what they call a once in a lifetime experience this Friday. They are opening a few bottle of 1945 Latour. The rub, its $250 a taste and $750 a glass. All I can say is "Geezus!". Would you ever pay $250 for a 2 oz. sample of wine? Seems if I could afford to drop that kind of money on a 2 oz. sample, I could afford the bottle (priced from $2500-$5800 on wine-searcher.com). What are your thoughts? Are you going? I just spent a fantastic evening with the folks at Binny's Schaumburg. The wine manager put on a fabulous sit down tasting of Bordeaux. All told we sampled 6 wines from the 2003 vintage, each from a different region in Bordeaux. Tasting of each wine included extensive discussion on the region's wines, soil, and location. The tasting was well organized. When my wife and I arrived, we were checked off the reservation list, and offered a seat. At each seat there was a map of Bordeaux, a description of each region we tasted from, a pencil, water, and 6 stems each with a couple ounces of wine. The wine was already poured and had had about half an hour to breathe. All told there was space for about 30 people to attend, and most of the seats were filled. The wines seemed carefully selected. Each wine was a high quality example of the DOC it was from. Prices ranged from $23.99 to $54.99, and each one seemed worth the price. The tasting consisted of a short discussion on the characteristics of the region, and a guided evaluation of the wine as we tasted it. I was very impressed with the guided portion of the tasting. Each time we were asked to evaluate the color, the bouquet, and the palate. What was most impressive about this process was the pace at which it was conducted. It is often the case that someone guiding me through the tasting of a wine will shout out descriptors before the wine has hit my lips, putting me at a handicap for making up my own mind. In this case the instructor's timing was such that I had time to consider the wine and what I thought before he added his own opinion to mine. He acted more as a sounding board for the group than a definitive authority. In fact I think it was an excellent opportunity to calibrate my own thoughts against his. At one point I suggested that the wine had a black licorice component to it; The instructor suggested that anise might be a better descriptor in this case. In another case, after we swirled and sniffed, he announced that the pronounced aroma was "pencil lead" which is a distinctive character of Paullac. One of the interesting things about a sit down exercise like this is the ability to go back to a wine from the beginning and try it again. I always feel like it takes a little bit of a warming up period to be able to pick out the nuances of a wine. Having that sample in front of me to go back to is always a good way to get the most out of a tasting experience. The tasting was free. In fact by village ordinance all the tastings are free at Binny's Schaumburg. This was a rare opportunity to enjoy some quality Bordeaux in a controlled setting, and I really appreciated it. Check the calendar for more tastings going on in Schaumburg in the coming weeks. I'll be posting the notes from some of the wines on Snooth in the next couple days. Be sure to check those out. Are "wine festivals" a ripoff? The Chicago area recently saw a flurry of wine festivals. I didn't go to any of them. I was put off by mediocre lists of wines, a high perceived price tag, and being limited to only sampling a few wines. I didn't want to post about my assumptions, because I figured it would be unfair to the event organizers. However, I did get some reports from people at the event, and they mostly confirmed my suspicions. Below you'll see why I decided not to attend these festivals. Remember that I didn't attend, and all my info is second hand, so take my thoughts with a grain of salt. Here is the basic pitch for the biggest one, the Windy City Wine Festival. On the north end of Grant Park, you get a wine event set up a lot like the Taste of Chicago. There are several vendors each with a table of wines. You buy tickets ($20 for 10 tickets). Each ticket is good for a 1 oz. pour. Note:the pourers are supposed to give you 1 oz., but they are pretty generous about giving a little more. There are food stalls, cooking demonstrations, and some music. On the surface, all that sounds like a pretty good deal. Here's where the rub is. I mentioned that I was put off by the lack of interesting wines. Basically every single wine at the festival is a mass market grocery store wine. I'm not saying they are bad wines, but there is nothing unique or distinguishing about any of them. Almost every one of them is produced by an international conglomerate and has few notable characteristics save for the label. So if you are like me, and you're looking for something new and interesting, you aren't going to find it. In addition, most of these wines come in with a pricetag around $10. I'm not saying $10 is a bad pricepoint, I've had phenomenal wines (not just phenomenal values) for $10. What I'm saying is that if I paid $20 to go to your festival, and you let me try 1 oz, of 10 $10 wines, you ripped me off. Sure some of that ticket price went to a band, cooking demos, and whatever else, but thats hardly the point. The average festival goer is there for the wine. Finally, the fact that I can only try 10 wines is silly. This is a tough one. There is a valid argument that letting attendees drink all the wine they want is irresponsible and even dangerous. I agree, and I'm not suggesting that the festival should over serve anyone. Limiting a drinker to 10 samples though, is the true ripoff. Maybe I would be more accepting of 20 tickets for $20, I don't know. Really I feel like if you are going to have an event like this, everything should be available to taste. If there are 20 wines I'm interested in trying, I should feel free to try them all. The point of an event like this is to discover new wines. Being able to try more wine is to the advantage of the person tasting, and the distributors pouring. The more I try, the more likely I will like something and buy a bottle (or 12). I just don't think a limit on tastes makes sense. If you went to one of these festivals, or maybe even organized or worked one, I'd love to hear your thoughts. Did you enjoy it? What would you like to see changed? This has absolutely nothing to do with wine, but some things are more important than staying on topic. I spent this past weekend on a fly fishing trip in Wisconsin. While most of the trip was focused on relaxing and enjoying the outdoors, I crossed the Mississippi River for a day to assist in the flood relief efforts in Rushford, MN. I'm not sharing this story to point out my do-goodiness, but rather to focus some attention on the plight of this river town along the Root. I went to Rushford thinking I would help clear up some downed trees, maybe help dry out a basement, or replace some moldy drywall. What I did instead was come to the realization that Rushford was in utter ruins. Rushford is a small river town along the Root River in Minnesota, and it is not unlike any other small midwestern town. Main Street looks like every other Main Street I've ever driven down, in most ways it is a perfect picture of Americana. I drove down a block where every single home on the street was condemned. Piles of trash (and by trash I mean everything the family owned) reached 8 feet tall in front of every home. Water heaters, pictures, beds, everything was trashed. As I understand it, most of these homes don't have flood insurance, and are relying on FEMA, volunteers, and other relief organizations for their recovery. While my overall impressions of the FEMA coordination center were very positive, I don't think recovery will happen without help. Chicago got hit with some of the same rain that Rushford did, and we felt some minor effects from the storms, but the people of Rushford lost their homes, their businesses, and in many cases their cars. These people are devastated. Despite the devastation the spirit of the people in Rushford was strong. The man who owned the house we were demoing seemed to be in disbelief when I arrived. I asked him how high the water came, he responded that it "came over the hood of the truck", but noted that "it could have been worse". Overall the people displayed a resilience and a determination to move on. If you want to help visit the United Way of Olmstead County. If you want to volunteer, but don't know where to start, call Nechama. They have the tools, the leadership, and the coordination to put a team of volunteers on the ground. They are a Jewish organization, but will take volunteers from all walks of life. This is not as massive a disaster as New Orleans, but on an individual level, it is just as devestating. I encourage you to help in any way you can. Thanks for your attention, and we now return to our regularly scheduled programming. Chicago Wine School's 5-week Wines of France course - Starting Sept 10th. This sounds like a great intro into the wine regions of France. 5 week course should cover Bordeaux, Burgundy, Rhone, and others. French Night Grand Tasting - Sept 27th. Sam's Chicago is hosting a huge tasting of French wine. I haven't decided if I'll go to this, but if you're a francophile (I love that word), or if you want to check out what all the hype is about, this would be a good event to check out. Binny's Bordeaux Seminar - Sept 25th. This looks like it will be a seated, reservations required, but FREE seminar put on by Binny's Schaumburg. This is the night of my anniversary, and my wife has been gracious enough to agree ti come along with me for this one. I'm looking forward to how this one turns out. Get your spots fast, because I don't think they will be available long. Binny's Bordeaux Tasting - Too many to list. Binny's has a bunch of Bordeaux tastings coming up in the next 2 months. Check out their website for the one closest to you. Sam's Academy "Great Red Burgundies" - Sept 25th. If you can't make it out to Schaumburg, this could be a good option. I suspect this won't be targeted at the wine newb, but it would be a good educational experience fro someone at any level. I have no doubt the wines will be top nothc examples of Red Burgundy. This one is $50. Update: FRANCE vs. the Rest of the World - Oct 4th. I just found this in the latest edition of The Juice. This looks like it could be really interesting. All the details are at the event page on The Juice. This is $55 and sounds like a no holds barred wine throwdown. Maybe a really good way to learn about French wines and how they are different from the wines of the "new world". The Windy City Wine Festival is coming up this weekend, and while I'm not going, I'd love to hear what others think of the event. If you've been in the past, or if you go this weekend, leave a comment and let me know what you think of the gathering in Grant Park. I'm a young professional living in the suburbs of Chicago. I love the city and have made it my mission to explore it and learn what it has to offer. I'm way into wine, as I'm sure you'll see. I'm also involved in Trout Unlimited and some boring professional stuff.